There are few things more disheartening than being super stoked about a game only to learn that you are less than stellar at it. I, for example, have always loved playing Super Smash Bros despite the fact that I am terrible at it. I’m the type of player that is just happy to not be the first person knocked out of gameplay when I play with my friends. With multiplayer functionality coming, I figured it might be helpful to pass along some tips and tricks for playing CyberThreat to help keep you from being the easy target in your friend group. This may seem like a given, but you would be surprised how often this simple technique is overlooked. Tell me if this sounds familiar? You are on top of a building and there is a hoard of bots/spiders down below you at the corner of the building. You try to look over the edge and shoot them, but without being able to visually acquire your target you aren’t having much luck. Obviously, you can solve the problem by teleporting to the ground or adjacent building to get a better angle, but in doing this you are bound to get shot a few times while you collect your barring’s and acquire your targets. 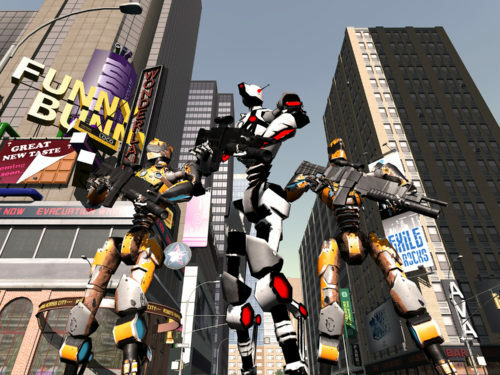 rner of the building, so before teleporting to the ground the player turns in the direction of the bots with guns drawn. Something tells me that this tip might come in even handier when you are facing actual people. 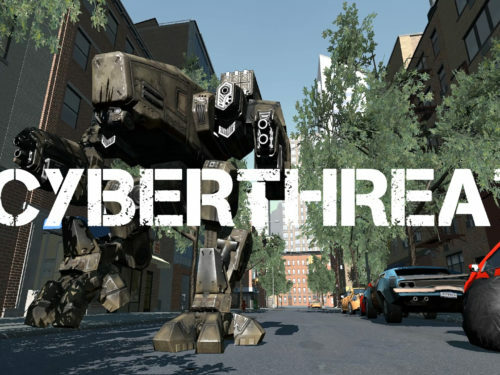 The vehicles that line the streets in CyberThreat are there, primarily, to satisfy your destructive tendencies. However, they can be used as effective cover from enemy fire if done right. First and foremost, you always want to make sure that you destroy said vehicle before you waltz up to it and start hiding behind it. Vehicle explosions do take a way a significant portion of your health. The key to utilizing vehicles as cover is two-fold. If you reach out and push on the vehicle (after it has been blown up) you will find that you can move the car. If you do this while walking you will have yourself some pretty decent mobile cover. The downside to this is that once a vehicle has been destroyed it will disappear after a short time, so this trick really only works as an easy solution to getting a better angle without exposing yourself. ste to your enemies the most effectively, allow me to help. The sniper rifle and assault rifle combination is by far the best weapon pairing in the game. The sniper rifle should be in whichever hand you are most comfortable using it in. This is typically determined by whichever eye you aim with. This long range rifle is the most powerful (non-rocket launcher) in the game. 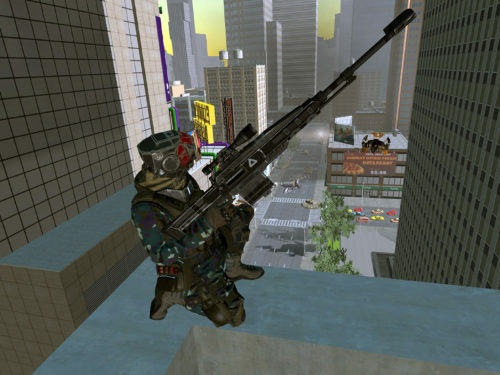 At a distance, the sniper rifle may take several shots to down your target, but at close range, a sniper rifle is a one-shot-one-kill machine. This makes it perfect for just about any enemy that you come across. The only time the sniper rifle is not effective is when you find yourself staring down a horde of walking bots or spiders. The assault rifle fire slightly faster than the pistol, but deals out much more damage making it super effective in spray and pray situations. At times in the later levels (for those of you playing the full version) the game action can be intense. Spiders, Mechs, and Robots from the ground and Droids from the sky makes for an interesting mix of enemies to fight off. But when they all converge on you at once you will find yourself hitting the “Back At It” button several times. From my time playing the game I have found that the best place to hide while maintaining a tactical advantage is the numerous fire escapes throughout the city. Now, not all fire escapes are created equally. Some of the escapes on the outer parameter leave you too vulnerable. The key is to find the escapes that are backed up to a corner of two buildings, and transport up to the middle of the escape. In doing this you will find that you are protected from above, below, and at least on side. All you have to worry about are droids flying up close to you, which makes some levels much more manageable.